How would you describe love? Perhaps words like reckless, foolish, impractical, naive, or old-fashioned may come to mind–at least through the eyes of the world. Love belongs in the land of fairytales, while in “real life”, you either eat or be eaten. I came to believe in this brand of “realism” over time–that most people would not live lives beyond working to put bread on the table. Growing up, my family struggled financially, and even when we didn’t, it felt as if we were always worrying about money. So who was I to dream? Plunging headlong into the stream of our rat-race education system, it was one term to the next, one exam after another, year in and year out. I became extremely jaded; my failures pained me as they confirmed the lies that I began to believe – that I was fortunate if I could be just average. My successes ceased to be sweet. It was nothing but pure luck. Even so, I used to believe in love. I grew up surrounded by a loving family. I believed that I was special, because I was loved. From early on, I had a sense that I would do great things when I grew up. I remember asking my mom when I was a kid (probably after doing something bad and feeling guilty about it): “Mum, is it too late for me to be a saint?” The word ambitious would have been quite an understatement to describe my aspirations then. It was clear as day that I wanted to be someone extraordinary. 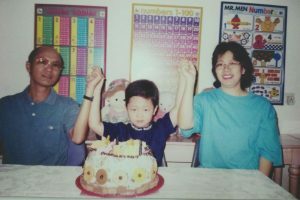 Sixteen tumultuous schooling years later, I was desiring for more in life. At the urging of a friend who graduated from university with me, the two of us signed up to be Campus Missionaries at OYP. In the Office, my whole worldview was turned upside down. OYP had always been a home for me. I had previously spent two months living there during the School of Witness (SOW) in 2014, a discipleship school organised by the Office. 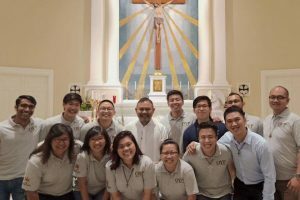 Throughout the next four years, I remained connected to OYP through Fides, the Catholic community in Singapore Management University. Yet, joining the Office team felt like I was entering a foreign place. I constantly worried about how people viewed me and my “performance”. I didn’t know how to behave around the people who had always been brothers- and sisters-in-Christ to me, but had suddenly turned into colleagues and superiors overnight. Feedback–no matter how constructive or kind (they were really very kind)–felt like a total judgment of my own competence. Deep inside, I became angry with God. Having sacrificed my time to work in the Church, I lamented on why God seemed so difficult to please. 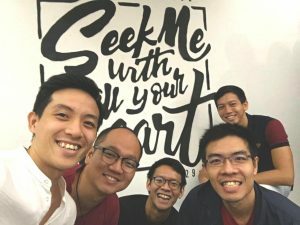 Two months into my stint with the Office, I attended the 10th run of Treasure, an encounter retreat for young working adults. I dragged my feet as I came into the retreat on the first day. Upon reaching OYP, a staff member noticed that something was up; after a brief chat, she prayed for me, as my eyes welled up with tears. That night, she was the face of Christ to me, who loved me even at my worst. 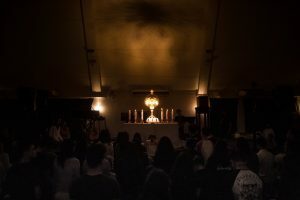 During adoration on the first session, when a brother came to pray for me and asked what I wanted to pray for, I said the most selfish thing that I had ever asked for: “I just want the pain to go away.” That prayer felt very lame. It wasn’t noble or sophisticated, but it was probably the most honest prayer I had ever uttered. And God granted my prayer. At the healing session on the last night of the retreat, I was seated right in front of the Blessed Sacrament. In all my anger, I felt like I could have struck the monstrance down. I released my anger in a loud scream. And absolutely nothing happened. I wasn’t struck by the proverbial lightning. God just remained still in the monstrance. And in that stillness, I came to believe that I am loved. God proves His love for us in that while we still were sinners, Christ died for us–Romans 5:8. In the Eucharist, He made present that act of love for me by coming down from Heaven to take the humble unassuming form of a piece of white bread, and subjected Himself to me screaming and sobbing uncontrollably before Him. I learned a lesson in humility; God was bigger than my anger and pain. In the weeks leading up to Treasure, this particular verse kept ringing in my head, and at first I couldn’t understand why: this is the work of God, that you believe in Him whom he has sent– John 6:29. I thought faith without works was dead (James 2:26), and believing was not enough. At Treasure, God revealed to me that I had been working not in faith, but out of fear that I would not be loved. And truth be told, no amount of praise and assurance would have convinced me of my belovedness, until I chose to believe it for myself. 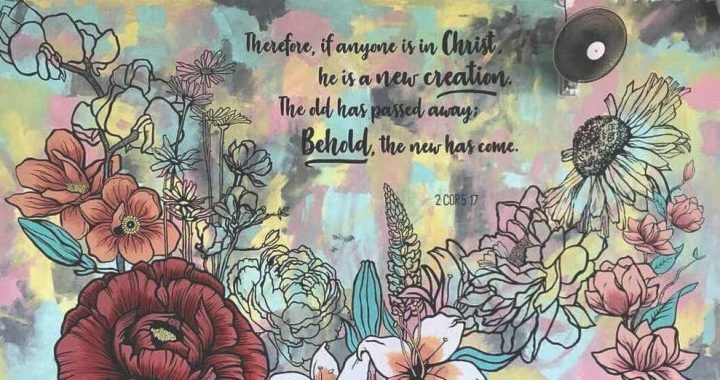 And by choosing to live in Christ, I am constantly being made into a new creation, regardless of anything that has happened in the past. Coming out of Treasure and going back to work, I began feel my belovedness again. It was like seeing things for the first time, in Technicolor. I now believe that I am so very very loved by God, and my family, community, friends, and colleagues. Of course, I realise that the people around me are only human, and themselves works-in-progress. Yet, I see the face of Christ in the smallest acts of love that they do for me. So now, at the end of my stint with OYP, I give thanks to God who has made everything suitable for its time–Ecclesiastes 3:11. I praise Him for my brother who encouraged me to give three months of my time labouring in His vineyard, for my sister who challenged me to grow by providing constructive feedback because she believed in me, for another sister who helped break down the walls of my heart at the start of Treasure, and for a dear brother who sees my potential more than my failures. I also thank Him for the many other brothers- and sisters-in-Christ who caught me when I fell, cheered me on when I was discouraged, and loved me for who I am, regardless of what I could or could not do. Friends, truly, perfect love casts out all fear! I invite you to begin or to continue to trust in Him, as I too shall trust in His promise: when you search for me you will find me; if you seek me with all your heart–Jeremiah 29:13. About the author: Hey! I’m Johannes, better known as Hans (second from left). Previously from SMU Fides, I am currently kick-starting a working adult community in OYP with other fellow University graduates. My favourite part of OYP is the office pantry. New wine is a four-part series on sailing through the storms of life with Jesus, especially when it feels like He is fast asleep (Mark 4:38). When the weight of the world crushes our being and we feel abandoned by the Lord, we are invited to trust that He is truly breaking new ground and making new wine in our lives. We praise God for moving the hearts of four young people to courageously pen down their experiences walking through troubled times with the Lord. Their hope and ours is that you too may find safety and confidence in Jesus, our Emmanuel – God who is with us.